Our five-sided gazebo offers all of the features of our popular six-sided gazebo in a smaller, lighter and even more affordable package. It weighs only 23.5 lbs. and offers 60 square feet of floor space. At 85 inches tall, there is still plenty of head room. 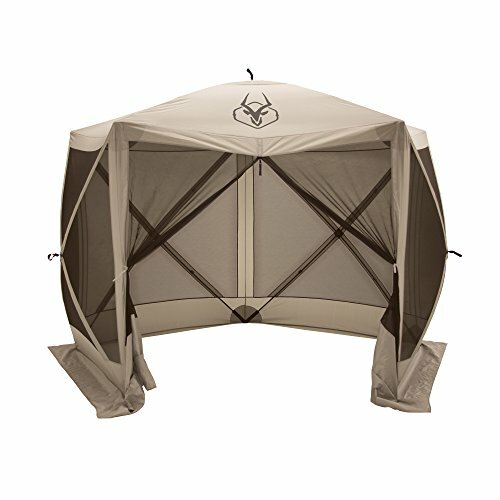 Featuring integrated lightweight fiberglass poles and durable hubs, the gazebo pops up in under a minute to create a rigid shelter from the weather and insects, and all of our shelters use top-of-the-line YKK zippers. It is the perfect gathering place for your next outdoor event. Umbrella Frame System - Nothing sets up or takes down faster! Portable and ready to use. You will love how easy it is to transport your Gazelle Portable Gazebo. Each Gazelle comes in a convenient portable carry bag and weighs only 23.5 pounds!